Well, it’s been almost a year since the disastrous (yes, I’m calling it that) last CMM Intl. trade show. It’s also now less than a year before the inaugural International Converting Exhibition USA (set for April 6-8 in Orlando). 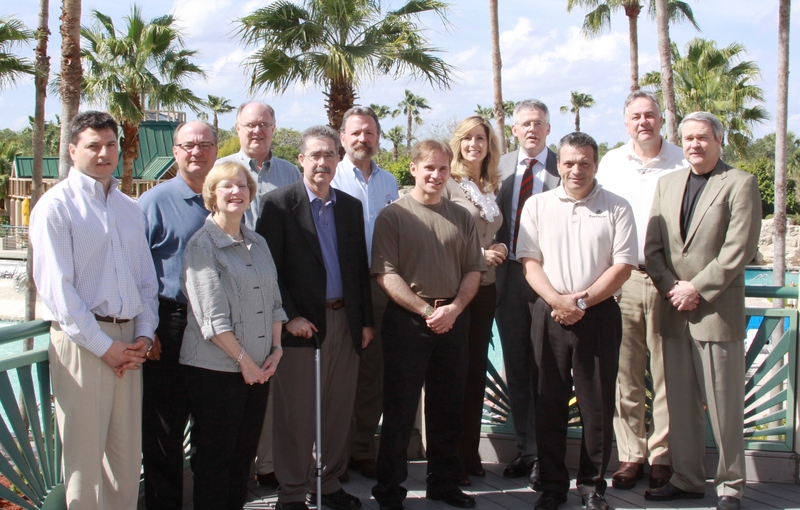 ICE USA Steering Committee (left to right): Michael Pappas (Catbridge Machinery), Craig Sheppard (AIMCAL) Yolanda Simonsis (PFFC), Bob Chiricosta (ICE USA), Mark Spaulding (The Converting Curmudgeon), Ed Montalvo (The Montalvo Corp.), Bob Pasquale (NEW ERA Machinery), Stephanie Millman (Maxcess Corp.), Michael Boyle (ICE USA), Kurt Oegerli (Daetwyler Corp.), Bob Dages (CoSo LLC), Roger Halligan (H+A Intl.). • Show hours are 9 a.m.-5 p.m. Wednesday & Thursday; 9 a.m.-4 p.m. Friday. The slightly shorter last day is in keeping with the Orlando touristy location and the idea that attendees (who bring their families for a Spring Break vacation) will visit ICE on the last two days, then head to the theme parks on the weekend. • AIMCAL will produce at least a two-day technical-education conference running alongside the show. Its involvement with much-earlier editions of CMM proved successful (Remember those SRO crowds that used to be at Dr. David Roisum’s web-handling sessions, etc.). In addition, TAPPI is planning a three-day “Flexible Packaging” Conference running April 4-6, finishing at midday on the first day of ICE USA. • An “Ask The Experts” Pavilion on the show floor will give attendees a 20-min opportunity for one-on-one brainstorming with a half-dozen technical experts in a broad range of printing and converting fields. Attendees would pre-register online for specific appointment times, and this Technical Advisory Service would be available during all 23 hours of ICE show time. • Concerted efforts will be made to involve more machinery makers in show planning and to especially communicate to them the benefits of ICE’s new venue in Orlando. Clearly, compared to Chicago (McCormick or Rosemont), lodging, rigging, drayage, on-site transportation and services are cheaper, and work rules are simpler. No wonder that the plastics show NPE and the huge National Restaurant Assn. show are both relocating to Orlando. The goal, of course, is more running machinery to draw in more attendees running around the show floor. Keep in mind, these plans aren’t necessarily set in stone, and a lot of work lies ahead. But you could just feel the excitement among the 12 of us at that Steering Committee meeting. I think there’s a great new enthusiasm in the industry for this new show. And as we pull out of the recession this year, 2011 will be a new-business springboard for the event. Now, I just need to see if Michael Boyle will allow The Converting Curmudgeon to stay on the Steering Committee. This entry was posted in coating/laminating, digital printing, flexible packaging, labels, package printing, paper/paperboard/cartons, printed electronics, slitting/rewinding, sustainability and tagged converting, flexible packaging, ICE USA. Bookmark the permalink.